Amusements will include will include a 55-ft. Ferris wheel, mechanical rides, and inflatable rides. There will be a charge for the mechanical rides. The inflatable rides will be free. The stage for the fair will be set up at 25th Street and Broadway by McDonald’s Restaurant. The opening ceremony for the fair on Saturday will take place at the stage at 11:00a.m. The starting event will include a Boy Scout flag ceremony and a rendition of the National Anthem by Samantha Baez. Musical acts and other performers will entertain from the stage on Saturday: Dance With Me, Pirate characters, Fairy characters, Melissa Rada’s Group, Jillian Torres, Joe Calamito (Doo Wop Music), Dynamics Band, Kay and Ray, Blue Dawg Band, and the Al Frantic Band. Bayonne High School Steppers, Super Hero characters, Princess characters, Strange Days. Shots, and The Detonators Band. at 201-858-6357 about using the dunk tank. 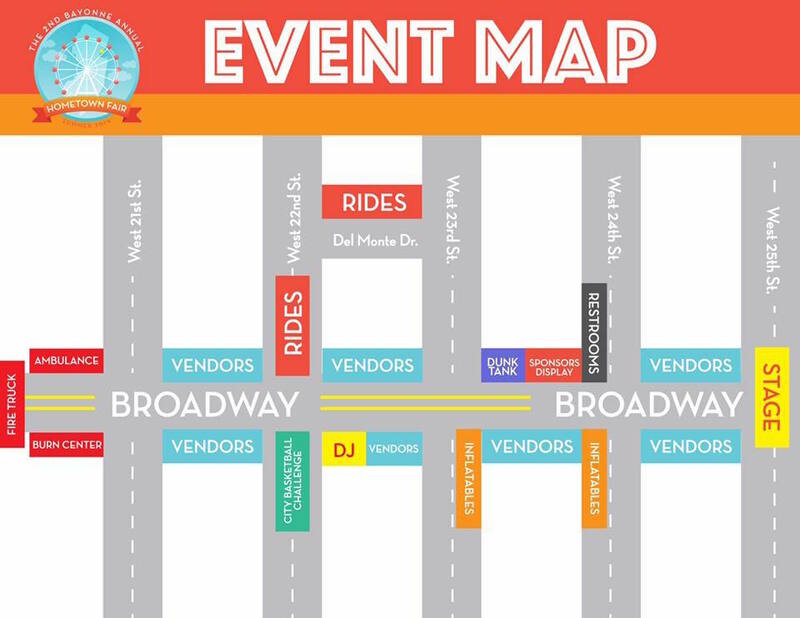 More than sixty vendors and organizations will take part in the fair, with tables along Broadway from 21st Street to 25th Street. The tables will feature food, merchandise, information about community organizations, and give-aways of various promotional items. Police, fire, and medical vehicles will be available for visits by the public. A CarePoint Health van will offer free health screenings. There is no rain date for the fair. In the event of rain, every effort will be made to continue or resume the fair on the scheduled days, as circumstances may permit.